Lightweight four season tent. Enhanced ventilation, for more comfortable spring, summer and fall use. 9.5mm 7001-T6 shockcorded aluminum frame. 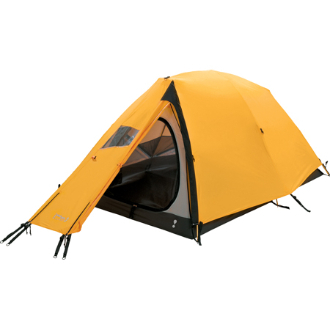 6 zippered High/Low venting (2 roof/4 sidewalls), side-opening door with twin-track zippers. Reflective web storm guy outs are visible at night. Front vestibule adds storage space, which includes a scoop vent. Storage features: 4 pockets, 4 gear loft loops & 1 flashlight loop. 3'4" H x 4'6" W x 7'6" L., weight: 7 lbs. 7 oz.